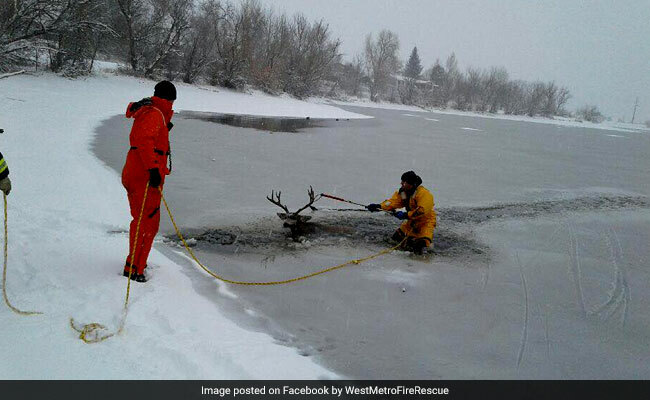 Firefighters in Colorado, USA, rescued a deer from a frozen lake by pulling it from its antlers. In a post shared about eight hours ago on Facebook, the West Metro Fire Rescue details how the deer was found standing in water, too tired to move. "We got a call from Lakewood Animal Control that the deer was in trouble," the department said. "He was actually standing in the water, but too tired to move." The firefighters then broke a path through the ice to help the deer back to land. "The team broke a path through the ice, grabbed onto an antler and then guided the deer back to shore," they write. Pictures shared by them show how the rescue took place. The post by the West Metro Fire Department has been shared over 300 times and has garnered over 1,700 reactions since it was shared eight hours ago. "I love that you dried him off too. This is great," writes one Facebook user in the comments section. "We saw the rescue!! Thank you!! It was amazing!!!" says another.